L.A.: James Bridle, Military Visuality and the Work of Art Symposium, a talk at Occidental College. Thursday at 12:45pm at Choi Auditorium, in Northeast L.A.
L.A.: Francesco Vezzoli, Cinema Vezzoli, at the Museum of Contemporary Art. Opens Sunday, at Grand Avenue. L.A.: Timothy Nolan, The Soft and Sweet Eclipse, at CB1 Gallery. Opens Sunday at 5pm, in downtown L.A.
L.A.: Sheree Rose, 100 Reasons, at Coagula Curatorial. Opens Saturday at 7pm, in Chinatown. S.F. : Wrong’s What I Do Best, at the San Francisco Art Institute. Opens Thursday, in the Walter and McBean Galleries. NYC: 13 Most Wanted Men: Andy Warhol and the 1964 World’s Fair, at the Queens Museum. Opens Sunday. NYC: Ultra Violet: The Studio Recreated, at Dillon Gallery. Opens Thursday, in Chelsea. NYC: Carrie Mae Weems, LIVE: Past Tense/Future Perfect, at the Guggenheim Museum of Art. Three days of art, music and performance in connection with Weems’s retrospective at the museum. Starts Friday, on the Upper East Side. NYC: Dinh Q. Lê, Warf Woof, Zero & One, at PPOW Gallery. Opens Thursday, in Chelsea. NYC: Eva and Franco Mattes, By Everyone, For No One, Everyday, and John Powers, +time, at Postmasters Gallery. Opens Saturday at 5:30pm, in Tribeca. NYC: Adriana Varejao, Polvo, at Lehmann Maupin. Opens Thursday, in Chelsea. NYC: Bob Colacello, Holy Terror: Photographs from Inside Warhol’s World, at Steven Kasher Gallery. Opens Thursday, in Chelsea. NYC: Sarah Charlesworth, Objects of Desire: 1983-1988, at Maccarone. Opens Friday at 6pm, in the West Village. NYC: Monika Zarzeczna, sculpture and collage, at Lesley Heller Workspace. Opens Sunday at 6pm, on the Lower East Side. There will be an artist talk on Sunday, May 18 at 4:30pm. NYC: Guillermo Kuitca, This Way, at Sperone Westwater. Opens Thursday, on the Lower East Side. 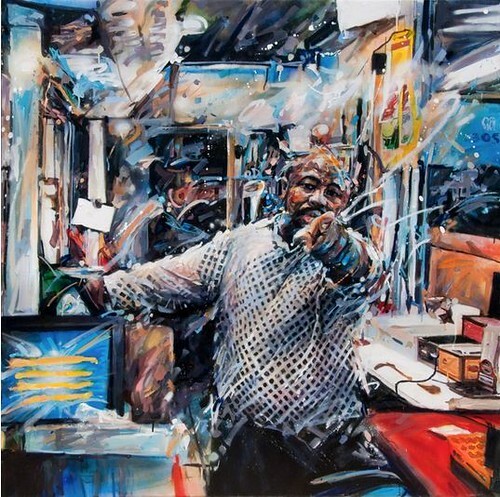 NYC: The ‘80s: Past + Present, at Bleecker Street Art Club. Opens Thursday, in the West Village. NYC: It Ain’t What You Make But What Makes You Do It, a tribute to Dennis Oppenheim, at Valentine. Opens Friday, in Ridgewood. NYC: Performa Events: Who Can Write About a Performance Art, with Claire Bishop, RoseLee Goldbgerg, Adrian Heathfield, Jens Hoffmann, John Rockwell, Hrag Vartanian and David Velasco, at Judson Memorial Church. Tomorrow at 6:30pm, in the Village. RSVP required. NYC: Julia Bland & Daniel Petraitis, Hard As You Can, Right at the Middle, at Asya Geisberg Gallery. Through May 10, in Chelsea. London: Hernan Bas, Memphis Living, and Christian Holstad, Corrections, at Victoria Miro. Opens Saturday.